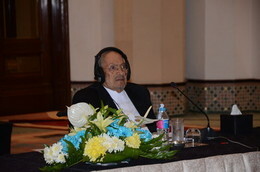 Under the patronage and chairmanship of HRH Prince Talal Bin Abdul Aziz, AGFUND, in partnership with ACCD, has organized the Sixth Meeting of the Higher Committee to Strengthen the Partnership between the Development Organizations Founded by HRH Prince Talal and the Media Development Dialogue Forum, during the period 13-14 July 2016 in Cairo. The Meeting has been attended by HRH Prince Turki Bin Talal Bin Abdul Aziz and the directors of more than 15 development organizations, as well as a number of media professionals. The meeting aimed at spotting the key steps taken by AGFUND and the other development organizations founded by HRH Prince Talal in some Arab countries, in order to consolidate future efforts and plans in line with the Sustainable Development Goals (SDGs), along with coordinating the plans and performances of these organizations with the changes of the International Development Program and the actual needs of Arab citizens. HRH Prince Talal Bin Abdul Aziz has signed four Memorandums of Understanding (MOUs) for projects funded by AGFUND; two MOUs with ACCD on the second phase of "I have Chosen Hope" Project and "Upgrading the Center of Kindergartens Development" Project, the third MOU with the Center for Arab Women for Training and Research "CAWTAR" on the role of civil society and media in achieving the SDGs, and the fourth MOU with the Open Arab University on the Conference of "Arab Teacher Preparation".